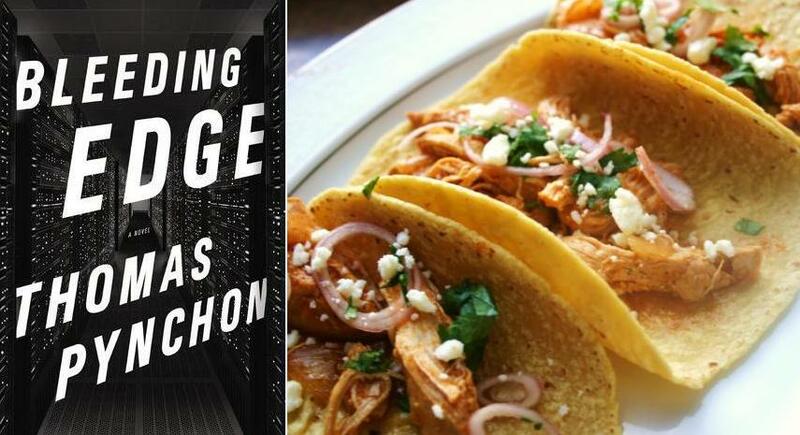 While all sorts of Mexican dishes appear in Pynchon’s fiction, two occur so frequently, they may as well be lead characters: tacos and beer. They’re an ideal pair, so why keep them apart until dinner is served? Better to let them meet and make friends early on. Beer-braising is one of my favorite ways to prepare chicken, which can all too easily turn dry or bland. This slow-cooker recipe solves both problems, with a smokiness from the chipotle and a sweetness from the spices that turn the leftover broth into another meal in itself. Use it to sauté some mushrooms the next day, pour the whole thing over a piece of crusty bread, add a green salad, and you’ll have another dinner ready to go—one that’s worth staying home for. 1. In a large skillet, heat 2 tablespoons oil. Pat chicken dry with paper towels and season with salt and pepper. Add to pan and cook until chicken is lightly golden but not cooked through, about 3 minutes. Remove from pan and add to the bowl of a slow cooker. 2. Add remaining 1 tablespoon oil to skillet over medium heat. Add onion and saute until slightly translucent, about 2 minutes. Add cumin, chile powder and garlic, and let cook another 2 minutes. 3. Add chicken broth to the skillet, scraping the browned onion off the bottom of the pan. Remove from heat and pour mixture into slow cooker. Add beer, tomato paste, chipotle chile, cinnamon stick and star anise. 4. Cook on high for 3 hours. Uncover, break chicken apart with a fork, then cover and cook 1 hour more. 5. Remove chicken from braising liquid. Add to taco shells and garnish with shallots, cilantro and cheese. 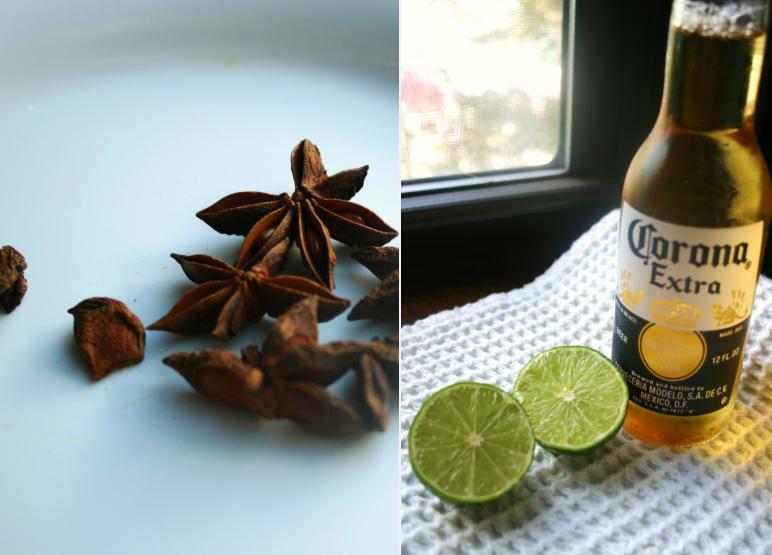 Squeeze lime wedge over and enjoy with several beers. Thank you (from California). We’ll be trying this out! Hope you enjoy – have a few tacos for me out there! This looks wonderful. Must try tonight! Let me know how it goes! It’s one of those dishes you get to enjoy twice – once by the cooking aroma alone, and then again when you actually dig in. This was absolutely wonderful. I made it with thighs that I skinned, but didn’t bone. Leaving the bone in doesn’t hurt and is less expensive. Braising makes the meat fall off. i dont have a slow cooker so just did it on the stove on low hear gor about an hour and a half. We can’t get the cheese you list in the UK so I used feta. My last alteration was that I added a bit of unsweetened chocolate to the sauce while cooking (and a bit more chipotle). It is definitely one I would do again–and for company. It’s true – keeping it on the bone never hurts, especially for a slow braise like this, when it just falls off anyway, and it can impart a bit more flavor. Glad it was company-worthy! If I were to use a dutch oven on the stove top, would i simmer (covered) over medium-low heat? I would actually stick it (covered) in the oven for about 2 hours on 325. That way you can leave it without stirring, and the bottom won’t burn. Hey we reposted this on Facebook. Never done it before, so I don’t know if they tell you. But we did. Beautiful post. Enjoyed reading it! Pingback: All the Trimmings: Mouthwatering Food Blogs on WordPress.com | AppsZoom - Download Free Android Apps! I just ran across this recipe and it’s in my slow cooker right now…the aroma is already tantalizing me. It seems a shame to waste all that wonderful broth when it’s done. Any ideas on how to use it would be appreciated. 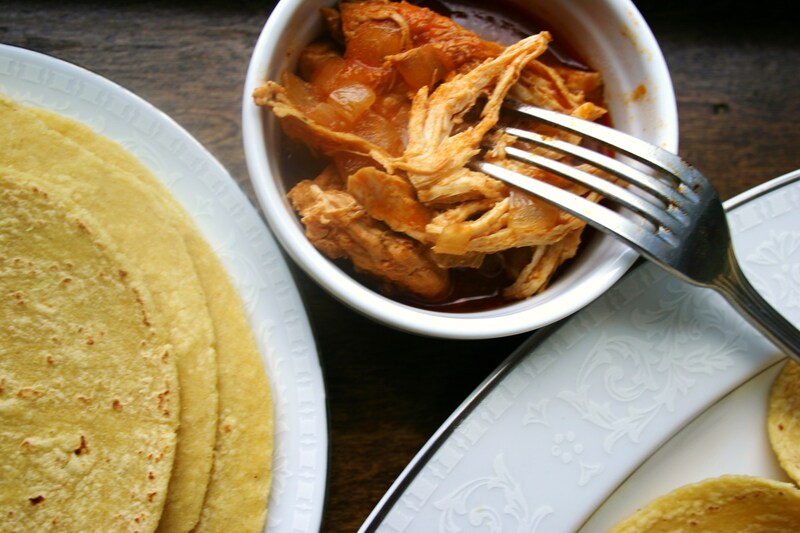 Glad to read this delicious braised chicken tacos recipe here. Definitely want to try this at home in weekend.